For more information, call or visit: CSA.CANON.COM 1-800-842-4534 Canon is a registered trademark of Canon Inc. in the United States and elsewhere. Océ and Océ Arizona are registered trademarks of Océ-Technologies B.V. in the United States and elsewhere. All other referenced product names and marks are trademarks of their respective owners and are hereby acknowledged. © 2018 Canon Solutions America, Inc. All rights reserved. 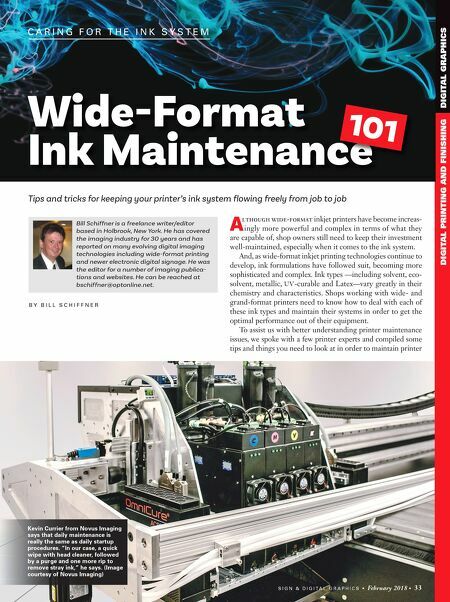 For over a decade the award-winning Océ Arizona® Series UV curable flatbed printers have become well known the world over for their exceptional versatility in producing a wide range of higher margin applications. In 2017 alone the Océ Arizona series has been awarded three additional SGIA Product of the Year Awards! Océ Arizona Series printers feature a true, stationary flatbed architecture up to 4' x 8' or 8' x 10' and deliver benefits like printing onto irregular shaped, pre-cut pieces without a jig, producing printed texture effects like embossed type, logos, natural textures and simulated brush strokes and so much more. OCÉ ARIZONA 6170 XTS - HFV 2017 UV FLATBED + WHITE $200K-$500K OCÉ ARIZONA 6160 XTS - HFV 2017 UV FLATBED $200K-$500K OCÉ ARIZONA 365 GT 2017 UV FLATBED Under $100K 2017 2017 2017 OR FINDING GOLD? 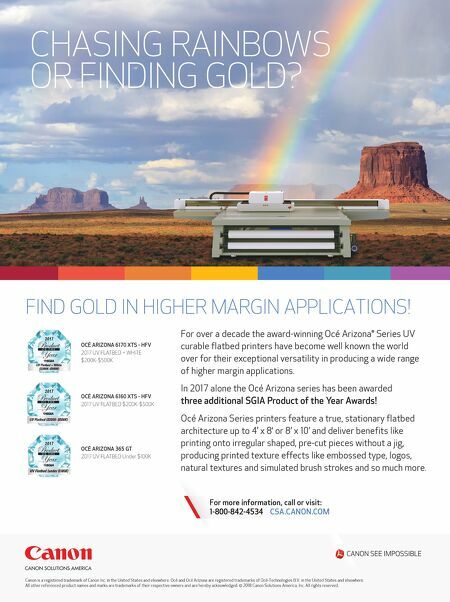 CHASING RAINBOWS FIND GOLD IN HIGHER MARGIN APPLICATIONS!